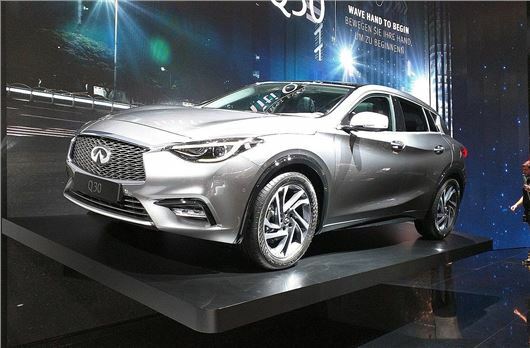 The Infiniti Q30, the family hatchback that’s one of two make-or-break cars for the Japanese brand in the UK, has made its debut at the Frankfurt Motor Show 2015 ahead of going on sale in late 2015. The Q30 is an alternative to the Audi A3, BMW 1 Series and Mercedes-Benz A-Class. Along with the QX30 crossover it forms half of a compact double act that Infiniti hopes will double its sales in the UK at a stroke. Click here to read about the QX30 concept car. Infiniti sold just 746 cars in the UK in 2014, representing a scant 0.02 per cent share of the UK market, although that was twice what it sold the year previous. But by entering the more popular family hatchback and crossover markets for the first time, Infiniti is expanding its appeal significantly. The Q30 will be produced at Nissan’s Sunderland plant from the end of this year, before going on sale at the start of 2016.